In Rome “the Christian” started to show up as a character in the ancient mime by the time Christianity makes its entry. He soon became one of the most acclaimed, comic roles. The roman mime was mocking the Christian ceremonies, especially the baptism and the communion, but also the Christian martyrs. As soon as the Christianity grows strong and gets power it forbids all forms of theatre. Off course the mime and the jester and jugglers as all Vulgar Comedy survived, but that is another story SEE HERE. One of the church fathers Tertullianus writes in his “De Spectaculis”: -“On the day of doom the actors will cry out louder than in any tragedy”. He also calls the entire splendor that was around the festivities diabolic. 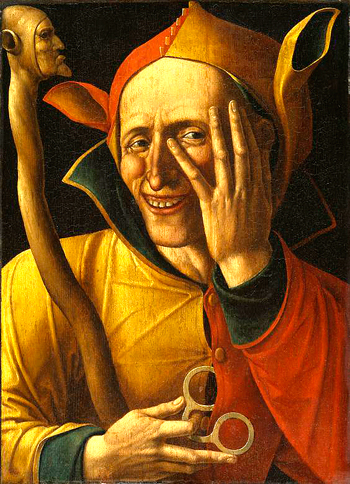 Johannes Chrysostomus says unequivocally that jokes and laughter does not come from God but from the Devil: -“a Christian shall be grave, suffer penitence and pain to expiate his sins”. We must remember that all hate for theatre that the church felt was not just because it was ridiculing the church and that is was immoral. By this time it was not long since Christians were thrown to the lions at the theatre. One of the reasons theatre was considered immoral and antichrist was its origins in and close relation to pagan and pre-Christian rites. Just the fact that redoing – with masks and dissimulation – coming from God (man was made as an image of God) is a sin and leads man closer to the Devil. Naturally here is also the claim from the authorities on control over the souls of man. They simply became afraid that if people go in to other roles they will be out of church control. One of the main reasons the church, after all and much later in the Middle Ages, starts to approximate to the theatre again is that the masses and services were held in Latin Since the fall of Rome the common languages Europe was back to their national languages, and only the learned and the priests understood. So in order to make the ceremonies comprehensible parts of the services became dramatized. Already during the early Middle Ages theatrical exercises, so called tropes, were intercalated as clarifying ingredients in the texts. These tropes were the embryo to the liturgical middle age drama – the theatre that would grow and revive the European official theatre and give it its form. This was a drama that in no way wanted to amuse or entertain its audiences, but to educate and foster. One of the earliest tropes is from th1 10:th century in S:t Gallen. A priest comes in dressed as an angel and takes place behind something that is supposed to represent Jesus grave. The three other priests come in dressed as the Marias. This entry was posted in 2 Vulgar Comedy, The Roots and tagged blog, blogg, buffoon, buffoons, carnival, clowns, comedy, commedia, Commedia dell arte, fixed masks, fools, history of the theater, history of theatre, Italy, jesters, Kompani Komedi, Kulturama, masks, Micke Klingvall, physical theatre, religion in theatre, religious plays, rite, rites, rituals, scandinavian theatre, skrattets historia, theatre education, theatre history, theatre teacher, theatrehistory, vulgar, vulgar comedy. Bookmark the permalink.